American Standard Companies, Inc. was a global manufacturer of plumbing, heating, ventilating and air conditioning (HVAC) systems and services, bath and kitchen products and vehicle control systems. The company was formed in 1929 through the merger of the American Radiator Company and Standard Sanitary Manufacturing Company forming the American Radiator and Standard Sanitary Corporation. The group was renamed to the "American Standard Corporation" in 1967. The company divested all but the HVAC business in 2007, and renamed itself Trane. Trane was acquired by Ingersoll Rand in 2008. In 1929, the American Radiator Company (founded 1892) merged with the Standard Sanitary Manufacturing Company (founded in 1875) to form the American Radiator and Standard Sanitary Corporation (as mentioned above in bold). The plumbing division, Standard Sanitary, would continue to sell their products under the "Standard" label until 1967, when the company changed its name to American Standard Corporation. The American Standard label was used for both divisions from that year on. 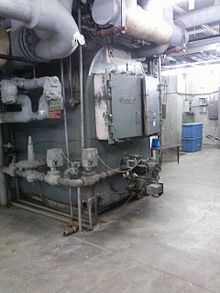 In 1929, American Standard bought the Kewanee Boiler Company which it kept until the early 1970s. In 1984, the group acquired HVAC company Trane. In 1999, American Standard purchased control of the United Kingdom-based Armitage Shanks and Ceramica Dolomite of Italy from Blue Circle Industries for $430 million. The vehicle controls division was spun off, forming WABCO Vehicle Control Systems. The kitchen and bathroom division was sold off: Bain Capital Partners acquired the division for $1.745 billion. Bain Capital sold the North American and Asian operations to Sun Capital and Lixil Group respectively, whilst retaining the European and Latin American operations as Ideal Standard. The North American operations became American Standard Americas, whilst the global business became Ideal Standard. The remainder of the company held was renamed, taking the name of its heating and air conditioning subsidiary Trane. Ingersoll Rand made an offer to acquire the company on December 17, 2007, and the sale was completed on June 5, 2008. ^ Hagerty, James R. (28 June 2013), "Japanese Toilet Maker Lixil Buys American Standard", online.wsj.com, The more than century-old American Standard was sold in 2007 to a Bain Capital Partners LLC fund for $1.76 billion. Bain sold the North American part of the business to Sun Capital for about $130 million and later sold the Asian business to Lixil, then known as JS Group, while retaining the European and Latin American operations, known as Ideal Standard. This page was last edited on 8 April 2019, at 20:10 (UTC).